Dr.Senthil Kumar Homeopathy Clinic - Velachery - Panruti - Chennai: Acne Pimples Homeopathy Specialty Treatment in Chennai, Pondicherry, Panruti. 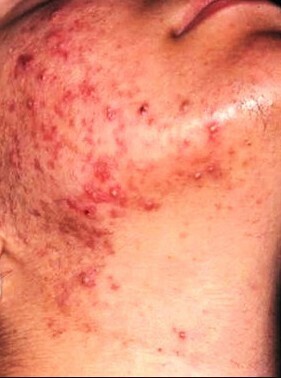 Acne Pimples Homeopathy Specialty Treatment in Chennai, Pondicherry, Panruti. Acne - Pimples, medically known as Acne Vulgaris, is a skin disease that involves the oil glands at the base of hair follicles. It commonly occurs during puberty when the sebaceous (oil) glands come to life - the glands are stimulated by male hormones produced by the adrenal glands of both males and females. Ø White heads Comedones - remain under the skin and are very small. Ø Black heads Comedones - clearly visible, they are black and appear on the surface of the skin. Remember that a blackhead is not caused by dirt. Scrubbing your face vigorously when you see blackheads will not help. Ø Papules - visible on the surface of the skin. They are small bumps, usually pink. Ø Pustules - clearly visible on the surface of the skin. They are red at their base and havepus at the top. Ø Nodules - clearly visible on the surface of the skin. They are large, solid pimples. They are painful and are embedded deep in the skin. Ø Cysts - clearly visible on the surface of the skin. They are painful, and are filled with pus.Cysts can easily cause scars. If you want to seek medical treatment from a specialist for persistent pimples or inflamed cysts to avoid scarring or other damage to your skin. If acne and the scars it may have left are affecting your social relationships or self-esteem, you need to consult a specialist.